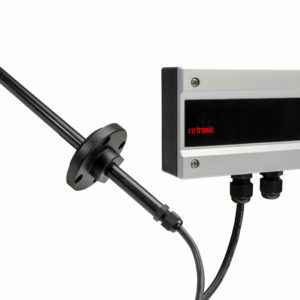 The classical combined sensor for off-shore applications. The robust design made from material resistant to seawater with special coating guarantee high reliability with error-free long time use. Wind values will be given as NMEA-protocol serially every minute. For applications close to the sea this sensor is the first choice for either extreme weather condition or on the sea. The intelligent AFP1 multi-parameter measuring instrument is ideal for spot measurements in HVAC systems. Thanks to easy operation via a smartphone, it is possible not only to take random measurements, but also to record, export and display data as wanted. 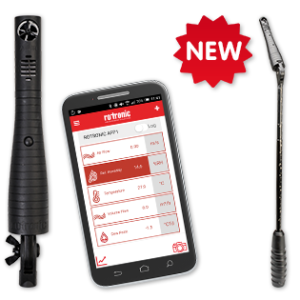 The AFP1 sensor is operated via Bluetooth communication with the ROTRONIC smartphone app, which can be obtained free-of charge from the App Store (iOS) or Play Store (Android). The app offers functions to display, log and send the required measured values by e-mail. It is also possible, among others, to define parameter-specific settings and options for the measurement.